Today we are very pleased to announce that Retro Games Party will be supplying the classic arcade for the Play Blackpool retro gaming event taking place on 3rd and 4th of May this year. Play Blackpool will be held at the Norbreck Castle Hotel, Queens Promenade, North Shore. Replay Events Ltd are increasing the Play Expo brand to two events per year with this being Play Blackpool and the other as per 2012 and 2013 being held in Manchester in the later part of the year. 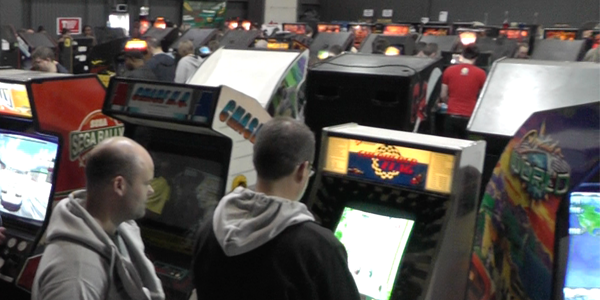 Retro Games Party provided nearly half of the arcade machines at Play Expo 2012 alongside the JAMMA+ Arcade Collectors Forum to bring the largest free to play arcade ever seen at a public event. Doubtless we are extremely happy for the opportunity to work on the Play Blackpool event – this can only be described as a return to the spiritual home of amusement arcades. “Blackpool has been a part of my personal history – it being a destination as a child purely for indulgence in arcade games and as a home later as part of a job – so the opportunity to work on something like this has a personal meaning and we will be doing everything we can to make this event one to remember. The excitement and happiness you can see on the faces of visitors both young and old is one of the greatest things you can experience” says James (RGP). The “Replay Arcade” has been a hugely successful part of Replay’s offering at their other events and we don’t believe Play Blackpool will be an exception. Although we will not be disclosing exactly which machines are going to be there at this time, expect to see the favourites you have seen before where we’ve been involved as well as a few you won’t have been able to play before. A drool-worthy collection of classic and modern machines is in the planning. Of course, we will confirm now that all of them will be on FREE PLAY – so no need for a stack of old 10p’s. We are constantly evolving our collection for exactly this kind of thing and it really is a labour of love to keep them all running. The Norbreck is a great venue for us to work with as the event hall is already multi-function and has a fairly substantial power and lighting installation of its own meaning the room can be lit to look more like the inside of a classic arcade meaning a better gaming experience.